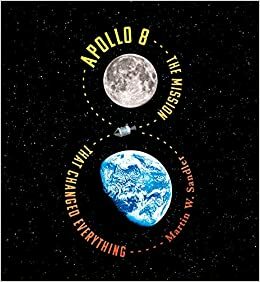 Summary: Coinciding with the 50th anniversary of the Apollo 8 mission, this book starts with a look at the history that led up to the first manned flight to the moon. The first chapter explores the space race, John F. Kennedy’s vow to put a man on the moon by the end of the decade, the early Soviet successes, and the tragic deaths of the three Apollo 1 astronauts in a fire. The rest of the book is about Apollo 8 and its crew, commander Frank Borman, Jim Lovell, and Bill Anders, who risked their lives to reach the moon. They succeeded in entering into orbit around the moon, becoming the first humans to view its dark side, then left lunar orbit and returned to Earth. Their TV broadcast from space was watched by millions of people, and and helped generate excitement about the space program. Bill Anders’ iconic photograph of the Earth rising is one of the most famous ever taken. The success of the Apollo 8 mission laid the groundwork for Apollo 11 six months later, when Neil Armstrong and Buzz Aldrin became the first to walk on the moon. Includes a bibliography and index. 176 pages; grades 5-8. Pros: Packed with exciting details and photos about the space program in general and Apollo 8 in particular, this large glossy book will appeal to aspiring astronauts in late elementary, middle, and high school. The cover design is one of my favorites of the year. Cons: Every several pages, there were 2-3 pages on a related topic inserted into the text. While these sidebar-type entries were interesting, they interrupted the main narrative in a way that was somewhat jarring.